Mountain Man is a large Wears Valley cabin rental that offers four spacious bedrooms and three bathrooms. 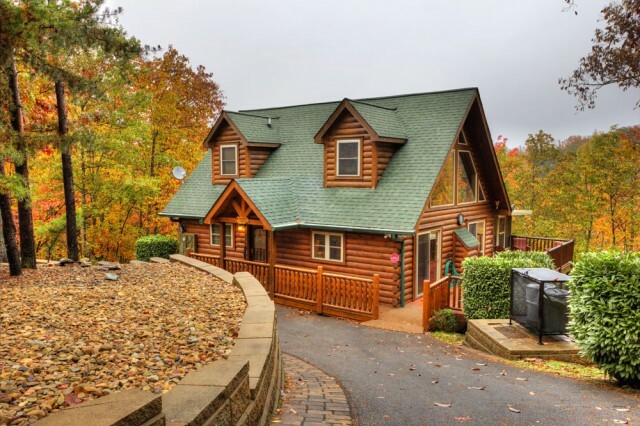 This impressive cabin in the Smoky Mountains is perfect for you to invite the whole family along for a memorable mountain escape this fall! Bask in the beauty of the mountains with the ones you love the most. There is nothing quite like fall in the Smokies, and Mountain Man is the perfect place to get the peace you’ve been craving. The gas fireplace only adds to the warmth and inviting atmosphere of this already welcoming cabin. You will notice that this becomes the centerpiece for good conversation and many of your best memories! Bring a good book, puzzle or board game and set up next to the fire on those cool fall evenings. There is nothing more peaceful than a roaring fire after a day of exploring in the crisp autumn air. The mountain views in this Wears Valley cabin rental will be on display throughout your stay, but the hot tub is on a screened in porch area on the back deck and is arguably the most relaxing way to enjoy these views. Relax, unwind and watch your worries just wash away! With two game room areas, there is never a shortage of activities and fun to be had! Games include an air hockey table, foosball, and arcade console so everyone has something to do! And even more togetherness will be yours in the large open kitchen and dining room that encourage quality time over a good meal. Three king beds, two single beds, and a set of twin bunk beds offer plenty of space to comfortably sleep up to 12 guests, making this Wears Valley cabin rental the perfect destination for your large group. Change things up this holiday season and embark on an adventure together that you will reminisce about for years to come. For more details or to reserve Mountain Main, visit our website! What are you waiting for? Our Wears Valley cabin rentals are ready for your arrival and the mountains are calling your name, so gather your group and head out or a much deserved vacation in the Smokies!